Your tax-deductible gift of $50 per month connects your child with a caring, Christian-based child sponsorship program that provides them with nutritious food and clean water, a church community, educational opportunities, important life-skills, shoes, clothing, medical care, and most of all, a loving home and family environment. Most important of all, your sponsored child will experience the presence and power of God. As they learn to love and trust the Heavenly Father, they will no longer feel orphaned. They will identify with being chosen rather than abandoned and joyfully become equipped to reach their friends for Christ. When you sponsor a child, you'll receive photos of your child and hand written personal letters from him/her. You will have the opportunity to communicate with your child. When children find out they've been sponsored, the joy they feel is indescribable. Just knowing that someone across the globe cares means more than you can imagine. Sponsoring a child will profoundly change the future for your child — and will change your own life as well. Give a child hope for the future — and for all eternity. Sponsor a child today! Upon completing your order, the first monthly sponsorship amount of $50 will be charged to your credit card. Each month after that, another monthly sponsorship amount of $50 will be charged to your card automatically. We gladly accept donations via mail at the following address. Please write your child's name on the memo of your check and make checks payable to "Prepare the Way Ministry". Remember that your ongoing monthly support is vital to provide your child with nutritious food and clean water, a church community, educational opportunities, important life-skills, shoes, clothing, medical care, and most of all, a loving home and family environment. Thanks for your support! Hellen Namugabo was born on November 10, 2003. She is from the Musaga tribe in the village of Magadda. Her mother, Hellen Bawaye, was killed in an accident in 2009. 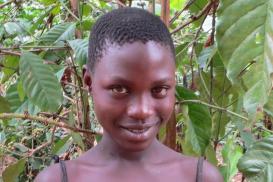 Her father, Moses Batwawula, died in 2004 with complications of hypertension. Hellen is an only child. When Hellen was just learning how to walk, her father died. At that time she was taken to live with her paternal grandparents, who with the assistance of other family members have been able to raise her to the age of 10. Hellen's grandfather passed away on March 28, 2014, leaving the elderly grandmother to care for Hellen alone. She has come to Prepare the Way Ministry requesting that Hellen be moved to Hope Children's Home. Hellen had so much life and love behind her sad eyes, that we opened up our arms to her. She finished out the week after her grandfather's death in her home village, but has now been welcomed into the Hope Children's Home family. She had her first 5 mile motorcycle ride into Lugazi for her physical exam. She said she had heard of a place called Lugazi but had never been there. Helen is bursting with happiness. She has received new clothes and her own bed. Hellen was attending a Catholic church prior to giving her life to Jesus at the Hope Children's Home and Community worship service just 3 weeks before coming to Hope Children's Home. We are devoted to advancing the Kingdom of God by training and equipping pastors, leaders, and believers to passionately seek after God through worship and prayer. We teach everyone to love and know the Word of God, and lead others by example into the lifestyle of Jesus Himself - to be powerful servants of all.